I first saw Killing Time with David Wenham on Foxtel a couple of years ago. I thought it was a compelling Australian Drama series with a great cast. However, it screened recently on one of the commercial stations and the constant commercial breaks made it almost unwatchable. It is interesting that a series of this type has its premier on Cable TV rather than Commercial TV. The reality is that the Free to Air TV channels have to pay their bills through commercials. There is a constant barrage of ad breaks during prime time and it is very hard to maintain concentration and follow the continuity of a series when you are continually interuppted by banal and annoying commercials. The Cable TV screening actually works very well with a series like this. They are also able to run multiple screenings of each episode at different times during the week so there is no excuse to miss anything. There are only small interruptions from commercial breaks. 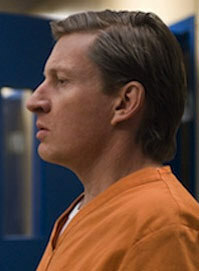 David Wenham is superb as Andrew Fraser, a lawyer who chooses the wrong clients. His family and friends know this and look on his successes with an almost condescending bewilderment as to why he seems drawn to representing criminals and exploiting loopholes in the law to set them free. Although he is successful he makes enemies with the police and has a tenuous relationship with the people he defends. Killing Time is told as two parallel stories - the past, with Fraser's rise to fame and success in making the police look like fools and the present, where he is incarcerated and trying to cope with life in prison. With each week we learn more about the man. It seems inevitable that things will eventually turn pear shaped for him. His strange penchant for defending criminals who are obviously guilty is a road to self destruction. He is ultimately his own worst enemy. Each time he wins in court and humiliates the police, he creates more enemies. He tries to justify his actions to his family but they clearly cannot accept that he uses legal arguments and technical points to defend vicious criminals. They would clearly prefer that he used his skills for more noble causes. The cast is impressive. Diana Glenn is a very promising actress and plays the role of his wife very effectively. Richard Cawthorne and Malcolm Kennard are both brilliant as the manic criminals that Andrew Fraser chooses to defend. Colin Friels is at his best as Lewis Moran. He plays one standout scene in a bar with classic understatement that will linger in the memories of anyone who sees the series. I think that screening Killing Time on commercial TV does the series a disservice. It needs to be seen without constant ad breaks. 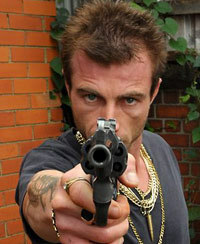 I would highly recommend Killing Time but, if you plan to see it, try and get it on DVD or wait for a rerun on Foxtel.